The outer shell of the pillow is made of bamboo fabric. A revolutionary new fabric that is stronger than silk. Softer than cotton. Extremely durable, and because it’s bamboo, it has natural heat dissipating properties that keeps the pillow cool all night long. Block memory foam can get hard and hold in heat! Miracle Bamboo™ Pillow is filled with shredded memory foam! It is both soft and supportive at the same time. It conforms to your shape for excellent support. 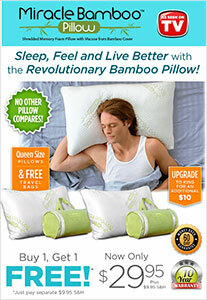 No other pillow feels like the Miracle Bamboo™ Pillow.